In Dream of a Sunday Afternoon in Alameda Central Park, hundreds of characters from 400 years of Mexican history gather for a stroll through Mexico City’s largest park. But the colorful balloons, impeccably dressed visitors, and vendors with diverse wares cannot conceal the darker side of this dream: a confrontation between an indigenous family and a police officer; a man shooting into the face of someone being trampled by a horse in the midst of a skirmish; a sinister skeleton smiling at the viewer. What kind of dream, or nightmare, is this? In the spirit of Surrealism, this is a complex dream. For Surrealists, like Salvador Dalí, dreams were the principal subject matter. Since dreams are so personal and strange, this allowed artists to juxtapose unrelated matter, like clocks and ants for Dalí. 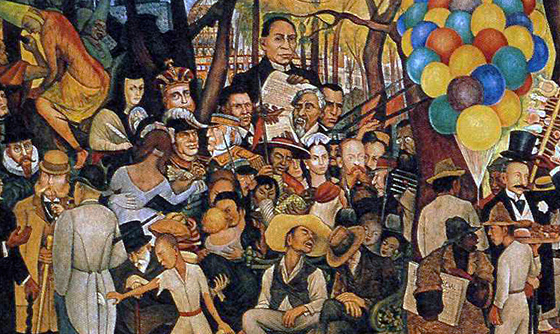 Though Rivera never officially joined the Surrealists, he uses this approach in Dream of a Sunday Afternoon in Alameda Central Park as he cobbles together a scene composed of disparate historical personages, including Hernán Cortés (the Spanish conqueror who initiated the fall of the Aztec Empire), Sor Juana (a seventeenth-century nun and one of Mexico’s most notable writers), and Porfirio Díaz (whose dictatorship at the turn of the twentieth century inspired the Mexican Revolution). Perhaps the most striking grouping is a central quartet featuring Rivera, the artist Frida Kahlo, the printmaker and draughtsman José Guadalupe Posada, and La Catrina. “Catrina” was a nickname in the early twentieth century for an elegant, upper-class woman who dressed in European clothing. This character became infamous in Posada’s La Calavera de la Catrina (The Catrina Skeleton), 1913. 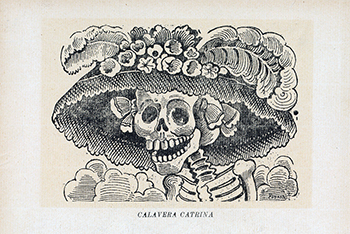 Here, the renowned printmaker depicted La Catrina as a skeleton in order to critique the Mexican elite. In Dream of a Sunday Afternoon in Alameda Central Park, Rivera reproduces the original Posada print and adds an elaborate boa—reminiscent of the feathered Mesoamerican serpent god Quetzalcóatl—around her neck. 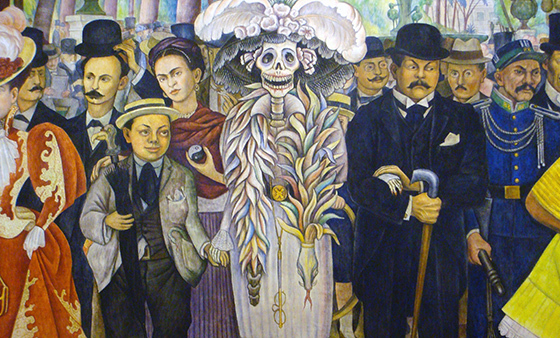 La Catrina unites two great Mexican artists in this mural: she holds Rivera’s hand as her other arm is held by Posada. Though Posada died in obscurity in 1913, artists later brought attention to his work and he was a significant influence on the Mexican muralists. The fourth character in this quartet is Kahlo. She stands behind a child-version of her husband, with one hand protectively on his shoulder as her other holds a Yin and Yang object. In Chinese philosophy, Yin and Yang refers to opposite yet interdependent forces, like day and night. Within the name of this concept is perhaps the most fundamental duality in humanity: female (“Yin”) and male (“Yang”). Thus, this Chinese symbol becomes a metaphor for Rivera and Kahlo’s complex relationship: Rivera began as Kahlo’s mentor; they then married, separated, and got back together; they were political comrades; and they painted each other frequently. Their double-portraits often reflect the state of the couple’s relationship at that moment. 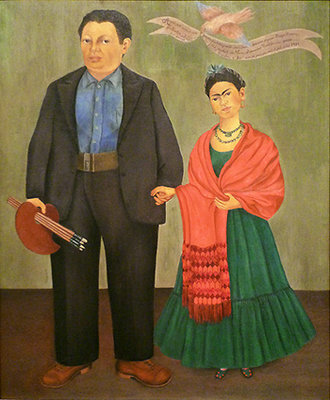 In Frieda and Diego Rivera (1931) Kahlo subtly plays with the couple’s stature in order to emphasize Rivera’s influence on her. 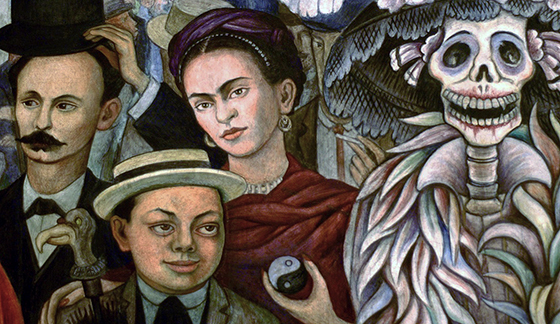 Kahlo was ill as Rivera worked on this mural and his diminished size may reflect his feelings of helplessness. 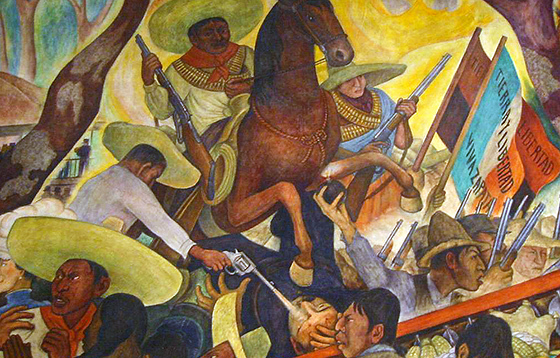 Stepping away from the center, if one reads the mural like a text, a chronology emerges: the left side of the composition highlights the conquest and colonization of Mexico, the fight for independence and the revolution occupy the majority of the central space, and modern achievements fill the right. For some art historians the central area is a snapshot of bourgeois life in 1895—as refined ladies and gentlemen promenade in their Sunday best, under the watchful eye of Porfirio Díaz in his plumed military garb. One gets a sense of the inequality that stirred average Mexicans to overthrow their dictator and initiate the Mexican Revolution which lasted from 1910 until 1920. In this light we can appreciate the dreams and nightmares within each epoch. To the left of the balloons the nightmares of the conquest and religious intolerance during the colonial-era give way to the dream of a democratic nation during the nineteenth century, represented by the over-sized figure of Benito Juárez, who restored the republic after French occupation and attempted to modernize the country as president. On the right of the composition, beyond the bandstand, the battles of the revolution give way to a society where “land and liberty,” as championed by the workers’ flags, becomes a tangible reality. More often than not history is written by the victor and thus reflects an incomplete story. Dream of a Sunday Afternoon in Alameda Central Park is an antidote to this: Rivera guarantees that histories normally edited out (the stories of the indigenous and the masses) have a place in this grand narrative. The artist reminds the viewer that the struggles and glory of four centuries of Mexican history are due to the participation of Mexicans from all strata of society. Cite this page as: Dr. Doris Maria-Reina Bravo, "Diego Rivera, Dream of a Sunday Afternoon in Alameda Central Park," in Smarthistory, August 9, 2015, accessed April 22, 2019, https://smarthistory.org/rivera-dream-of-a-sunday-afternoon-in-alameda-central-park/.